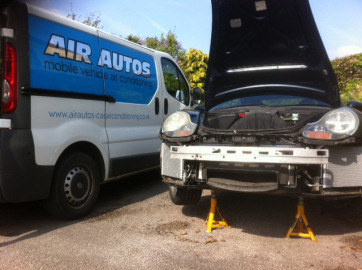 Air Autos are specialists in Air Conditioning Repairs as well as providing the Regas Service. Repairs may be required due to a fault or damage of a key component i.e. compressor seized up, condensor or receiver drier damage, etc. As Air Conditioning Specialists Air Autos have access to a wide range of both OEM (Original Equipment Manufacturer) parts and Non OE parts, all of which are fully approved and we often can source replacement parts on the same or next day. 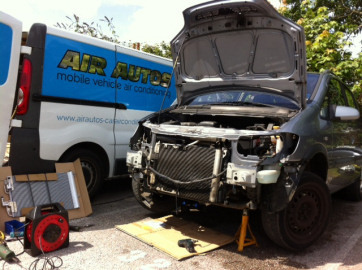 Most repairs can be done at the site of the vehicle (either home or work). As mentioned in Leak Testing one of the most common air conditioning failures is lack of refrigerant in the system. Quite often a leak may be caused by a perforation in one or more of the air conditioning hoses / pipes. Replacement pipes and hoses can be very expensive and sometimes difficult to source. Air Autos offer a fast and efficient specialist pipe and hose repair service using specialist Vulkan Lokring pipe repair equipment for both rubber hoses and aluminium pipes. 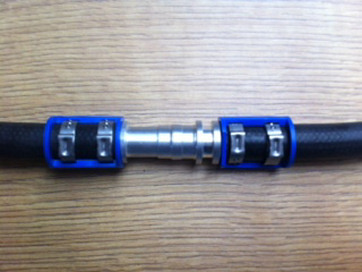 For aluminium pipes the Vulkan Lokring technique is a solder free connection using simple hand tools. It guarantees a clean, permanent, hermetically sealed connection. Most jobs can be completed there and then on site saving the customer time and money.